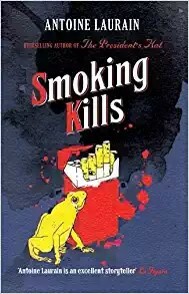 Smoking Kills is one heck of a book, sharply [and] skilfully translated by Louise Rogers-Lalaurie. What it is not - is a traditional murder mystery. From the outset, narrator Fabrice Valantine warns his story involves a murderous rampage through the beaux-quartiers of the French capital. He also makes clear the French justice has done its bit and he is cheerfully serving a lengthy sentence; and he’s smoking his lungs out while he contemplates the spree that lands him in jail. It all starts when Fabrice tries to give up his decades-long habit. A head-hunter at swanky Parisian recruitment company HCB, our sometimes reliable (sometimes less so) narrator won’t give up smoking in his office without a fight. But it is 2007 and French legislators have other ideas. Fabrice and his fellow nicotine-addicted colleagues are forced onto the street. His wife Sidonie, attempts to help by recommending a hypnotist. Grudgingly, he makes the appointment. And that is when it all goes up in a puff of a nasty cloud of malice. A smug young Turk is parachuted in on the death of HCB founder Hubert Beauchamps-Charellier. Fabrice does not kill his mentor and friend HCB – the guy has some principles. And so the slaying continues, with bizarrely created corpses popping up hither and there. Thankfully for the reader, this is not some random killing joyride but a languorous, intelligent amble through the mind of a skilful taker of lives. The cover suggests that a frog contributes to one character’s demise and indeed – one victim croaks because of a frog. An obnoxious neighbour meets his maker in a manner that should give any professional window cleaner pause to reconsider his profession. And so it goes. The reader can guess who some of the victims will be, but not always how or where they meet their Maker. The strongest thing about Smoking Kills is Laurain’s capacity to address multiple themes without being superficial or overly detailed. Valantine is snarky, self-satisfied, flawed but never boring. The writing is so strong, the innocent turning on a dime and into a killer doesn’t jar. This is true, I suspect even for those readers with no first-hand experience of a nicotine detox (the process will make anyone irritable, violent, and perhaps homicidal). Compact at 225 pages, the book delights in mocking pretentious artists, lottery players who keep smokers from their poison in tabac lines and of course, sanctimonious non [and former] smokers. Laurain has enough in the book to entertain but not so much as for us to tire of this efficient killing machine. This book could not have been set anywhere other than Paris. It is all there – hookers in the Bois de Boulogne, terrifying muggers on long métro quays, lugubrious railroad apartments show up on the pages along with the attractions that Brits seek out on the other side of the Sleeve. Smoking Kills is a romp and a satire and it is a reminder of all that is funny-peculiar about Parisian culture. Read this book. It will be good for your health.